E. E. Barnard is an astronomer perhaps best known for measuring the proper motion of a faint red dwarf about six light years away, now known as Barnard’s star. But Barnard was also a pioneer of astrophotography, and he did a great deal of work studying dark nebulae. Dark nebulae are clouds of dust that are so dark they absorb most of the light in the visible spectrum. It takes astrophotography to study them, because they are only seen as shadows against background light from emission or reflection nebulae. Capturing their image takes long exposures, and Barnard was able to capture many of them in the early 1900s. By 1919, Barnard had cataloged 182 dark nebulae, and published this in the Astrophysical Journal. He went on to catalog a total of 370 dark nebulae, now known as Barnard objects. 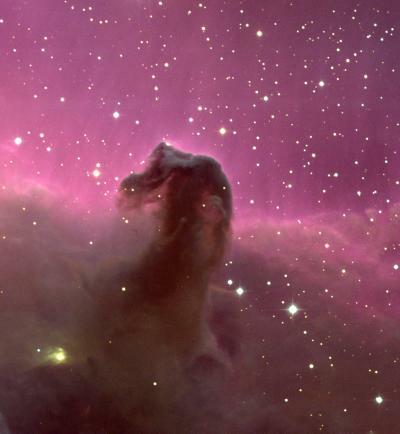 Perhaps the most famous is B33, also known as the Horsehead nebula, seen above. We now know that dark nebula contain dust grains that are nanometers to millimeters in size. This is why they scatter or absorb visible light. Their dark interiors can be quite cold (10s of Kelvin), which can allow for the formation of complex molecules. We can also see what is behind them in the radio spectrum, since they are generally transparent to radio waves. But it was during the dawn of astrophotography that we began to understand these dark shadows in the night sky.